Cosmos Cat was painted with Golden brand acrylic paints. Golden heavy molding paste was used to build texture. The final varnish coat was Krylon Gallery Series UV Archival in Satin. The clear plastic bubble came from 1000bulbs.com (excellent service and product!). Finally, during this project I discovered some wonderful synthetic brushes, Escoda Versatil Sintetico. The Live Auction and Gala Dinner Event are now over, and the Cat Care Society raised over $100,000 with this fundraiser! A great summary can be read HERE. My oil painting Tiger Lily Nouveau sold in the silent auction for $280. 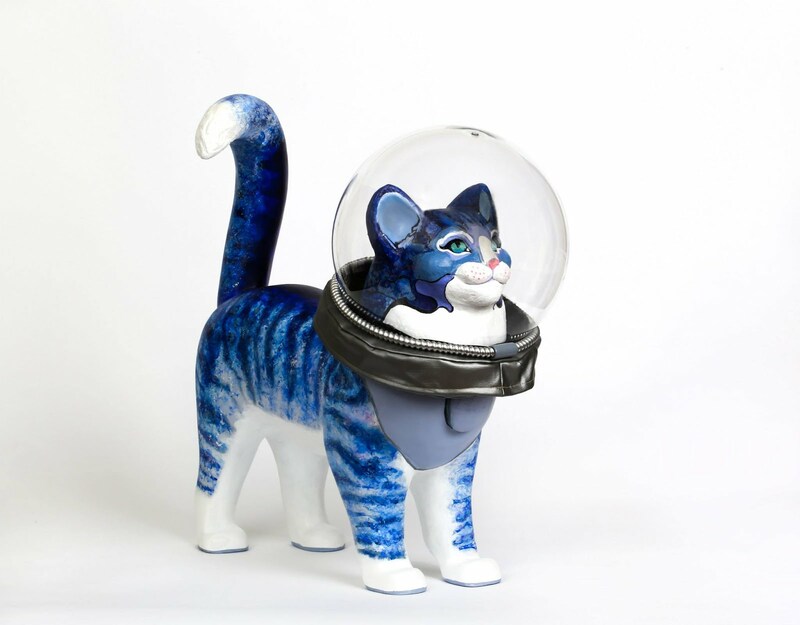 Cosmos Cat sold at the Buy It Now (BIN) price of $3,000. Thank-you to everyone who placed bids, bought dinner tickets, made donations, and supported the Cat Care Society through their TOPC fundraiser! The Cat Care Society took publicity photos of all of the completed cats, and here is Cosmos Cat with his bubble helmet! A BIG Thank You to Carol Blair who sponsored Cosmos Cat. 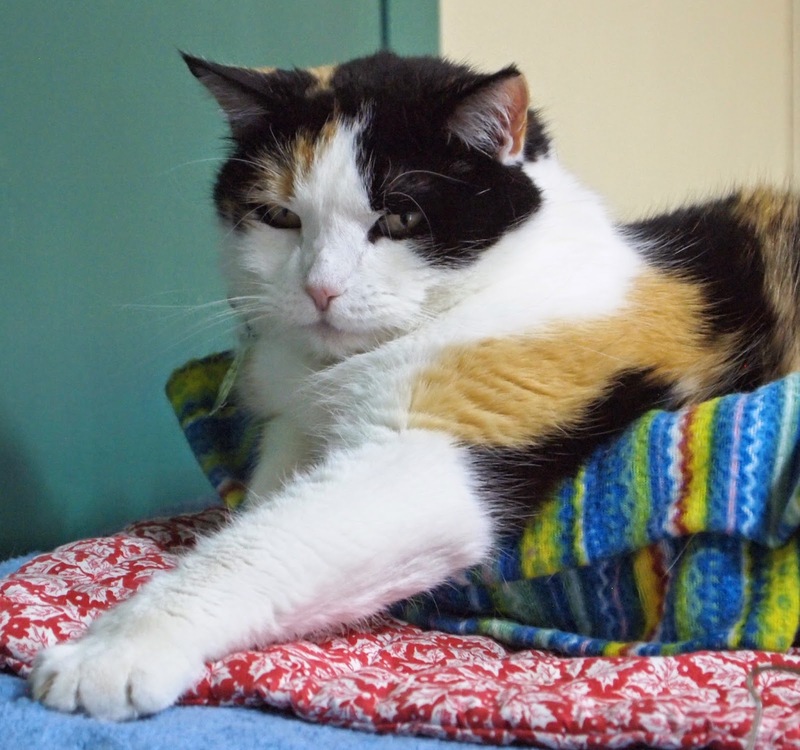 Thanks also go to the Cat Care Society for this incredible publicity photo! Finally, a Giant Cosmic Thank-You to the Ever Amazing Jane Dorsey for her solid advice, support, and patience during the Cosmos transformation! 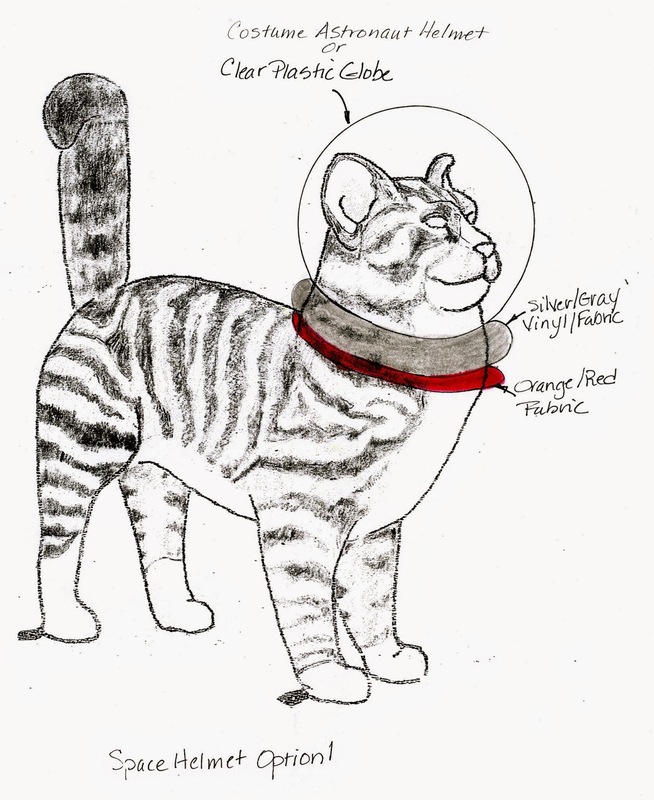 These pictures of the completed Cosmos Cat were taken before the bubble helmet was attached. I'll be posting pictures of Cosmos with his bubble attached in the next update of this blog. 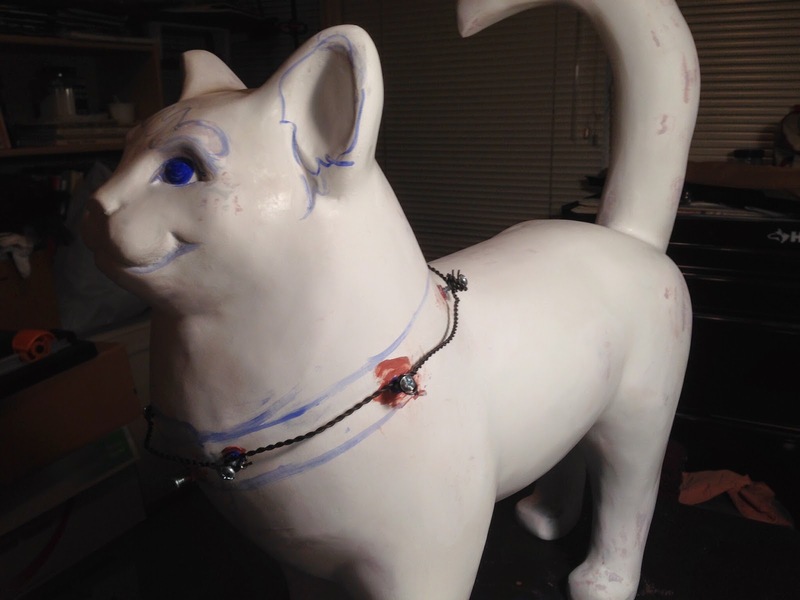 Once the first few layers had hardened, it became a faster process of building up the collar for Cosmos Cat. With the basic form in place, I added some "L" brackets to support the bubble. I want to be able to remove the bubble easily, just in case something happens in the future when Cosmos Cat might need to be repaired or modified. I continued to build up around the brackets with Hard Molding Paste and created a "fur" ruff to cover the metal brackets and screws. The fit is getting there. I still need to build it up in a few spots. 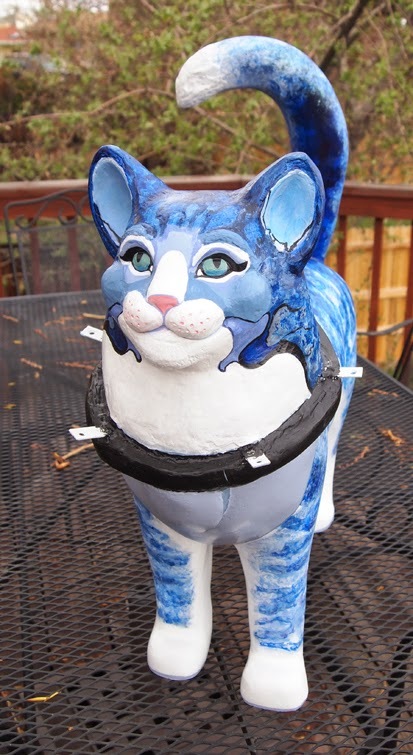 As you can see, I went a little crazy with the hard molding past on Cosmos Cat's head. There's still a little modeling of his chin remaining, and I'm debating on how much texture to add to the rest of his body. With his striped pattern, a lot of texture may be too much! 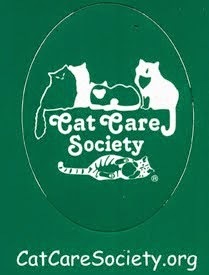 The Cat Care Society held a "Meet and Greet" at the "Cat House" for the artists and sponsors of the Painted Cats. Attendees sipped champagne and munched on yummy desserts while visiting with each other and enjoying the antics of the resident cat population. A slide show and portfolio showed the previous four years of the Painted Cats. This year's designs were displayed in a separate portfolio, onto which one young feline parked herself, as if to say,"Hey! It's all about me, you know!" 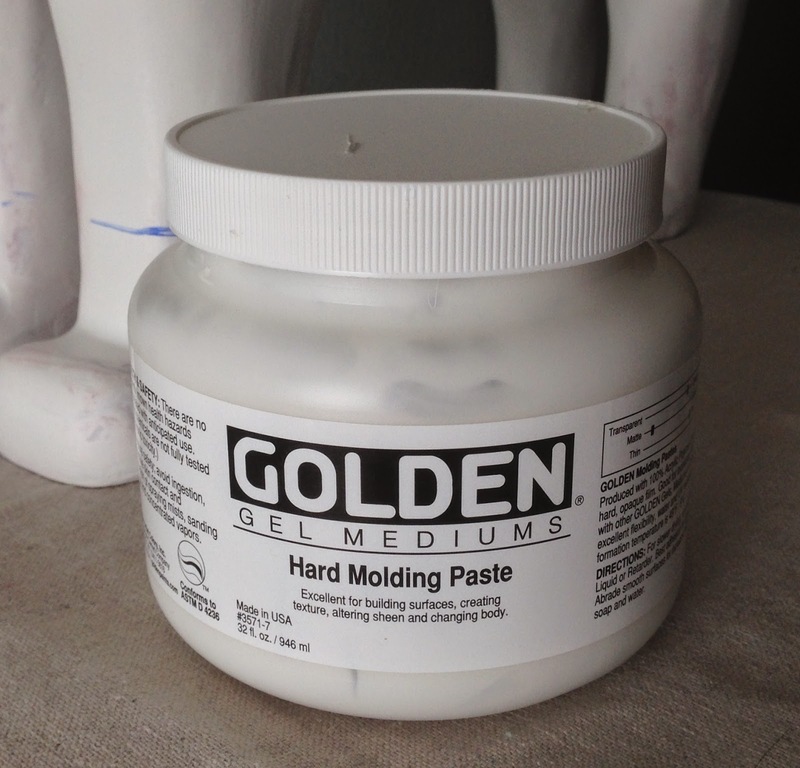 Meanwhile, I have been playing around with Hard Molding Paste manufactured by Golden. It has become my new favorite art material, and I can see endless possibilities for its use. I am using the Hard Molding Paste to build up Cosmos Cat's collar, which will eventually support the clear acrylic globe (or "bubble") that will cover his head. The Hard Molding Paste has some interesting properties, and it will take several layers to build it up to the size needed. 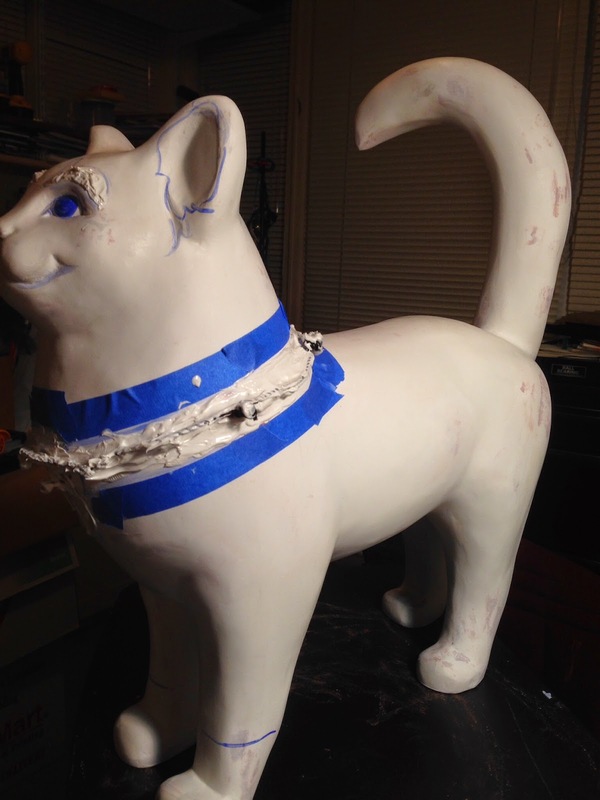 I created an armature around the cat's neck to provide support for the Hard Molding Paste. 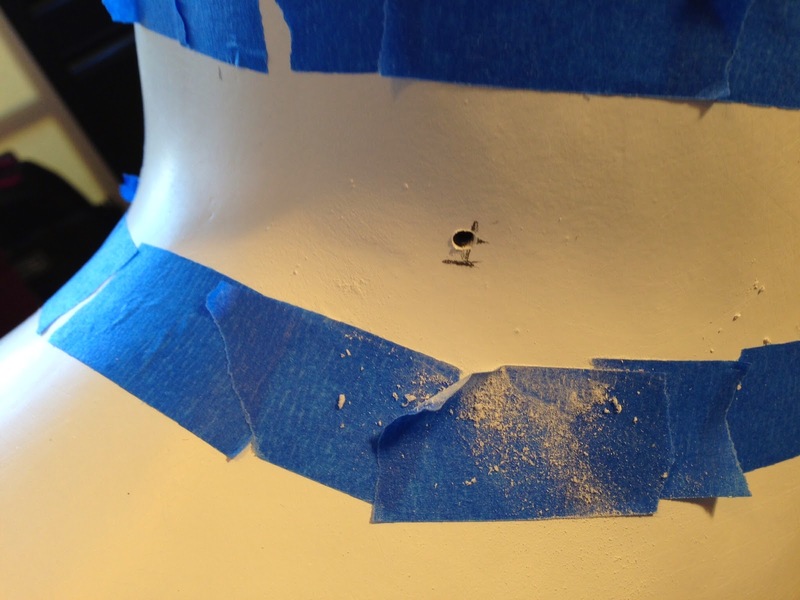 I began by drilling six holes spaced evenly apart around the entire neck, making them large enough to insert plastic anchors for screws. Next, Bondo epoxy was applied into the screw anchors, and a screw was driven into each anchor until about 1/2 inch of the screw stuck out above the cat surface. Finally, I attached a thin, flexible wire (rebar tying wire) to each screw head, creating a wire ring around the cat's neck. The first three layers of Hard Molding Paste were applied in the next photo. It takes about a day to harden before the next layer can be applied. It will take a number of layers to build up the collar enough to support the bubble. 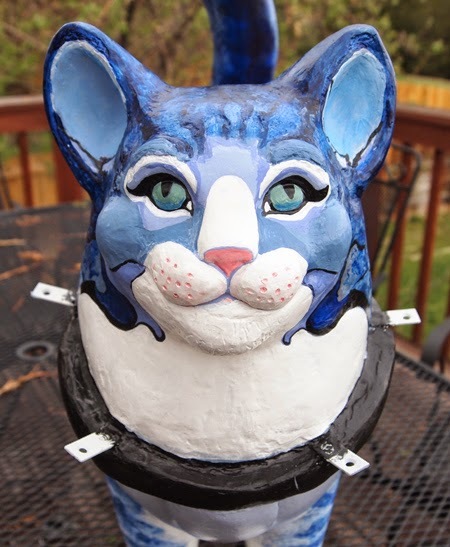 The Hard Molding Paste also will be used to build up "fur" on some areas of Cosmos Cat. 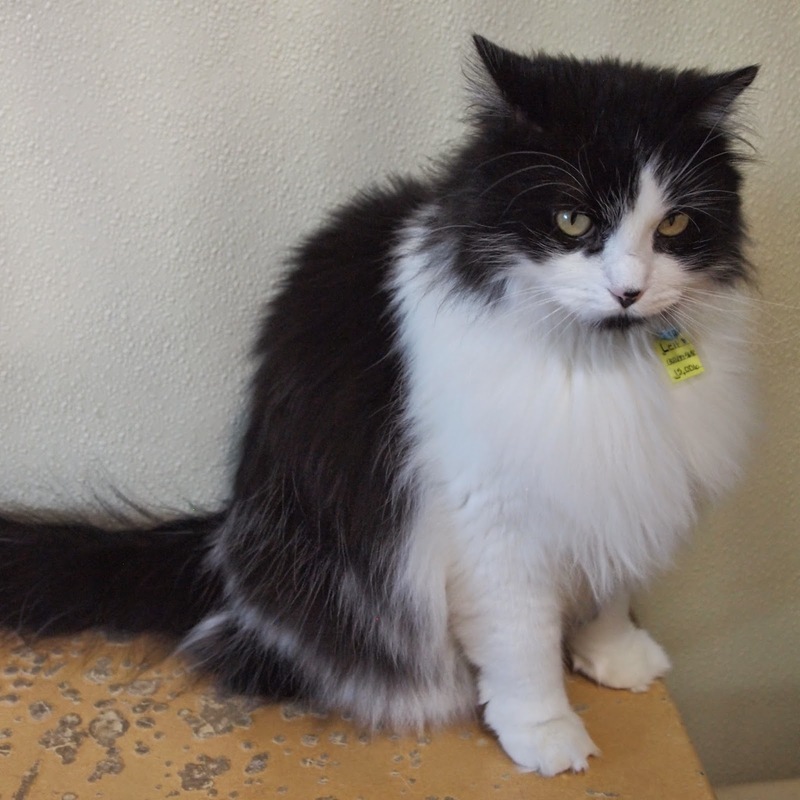 I spent a couple of hours at The Cat Care Society, meeting all of the residents and grabbing a few photographs of them. Once thing that struck me was the flow of volunteers who keep the facility clean and who care for and play with the resident kitties. Running any animal shelter is a challenge, but the Cat Care Society uses a large group of volunteers to keep everything going smoothly. Here are three of the furry friends I found. They would love a forever home! 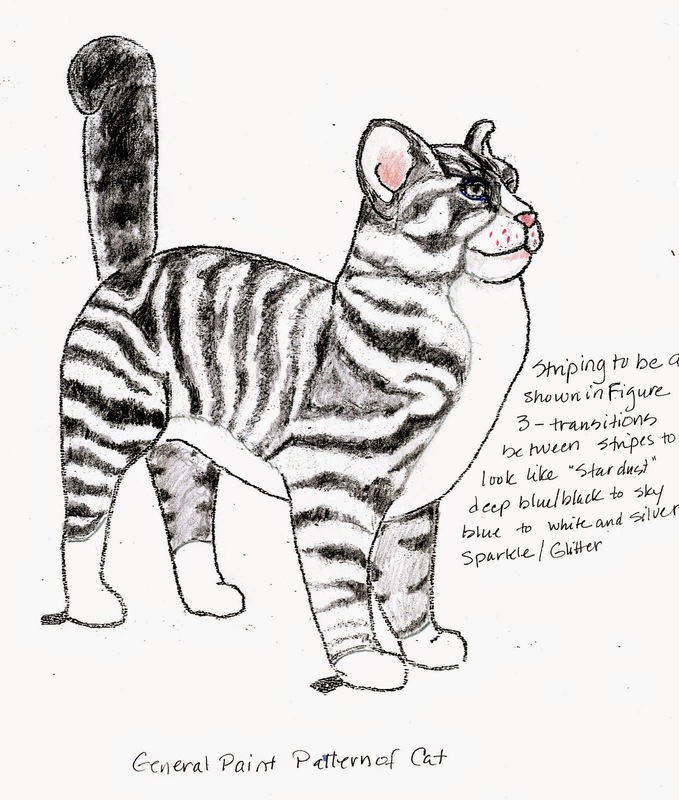 I am using Murtaugh's tabby pattern as a resource for Cosmos Cat. 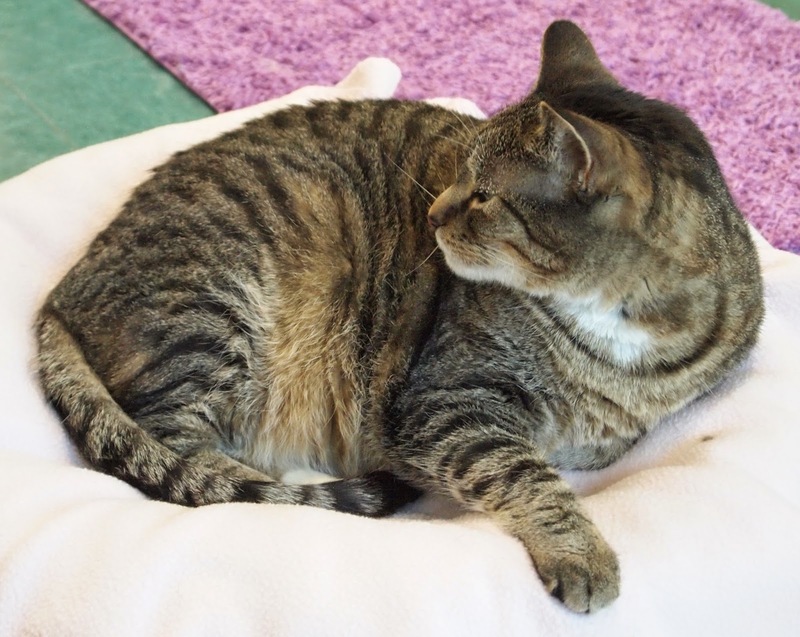 Visit the Cat Care Society's website for more furry friends and to find out more about this fabulous non-profit organization! 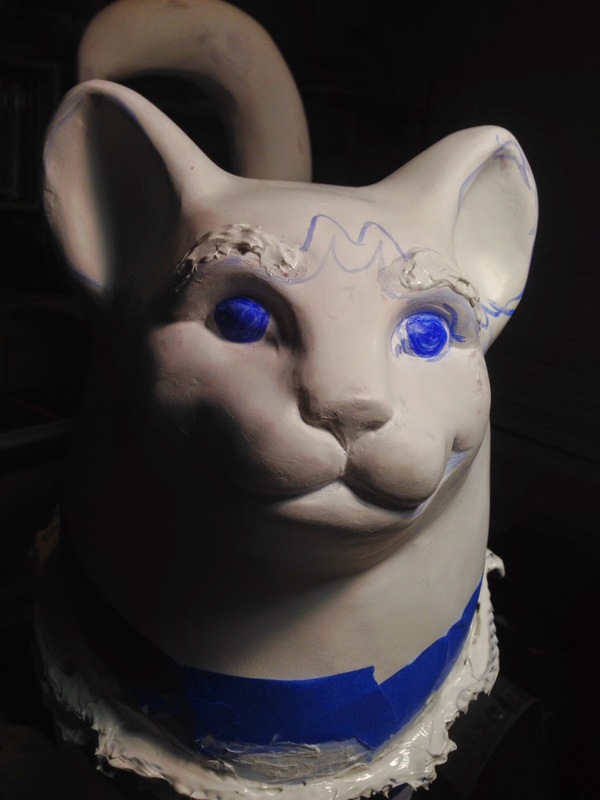 The fiberglass cat statue arrived with a gessoed surface, but there are a number of rough patches that need to be sanded smooth. 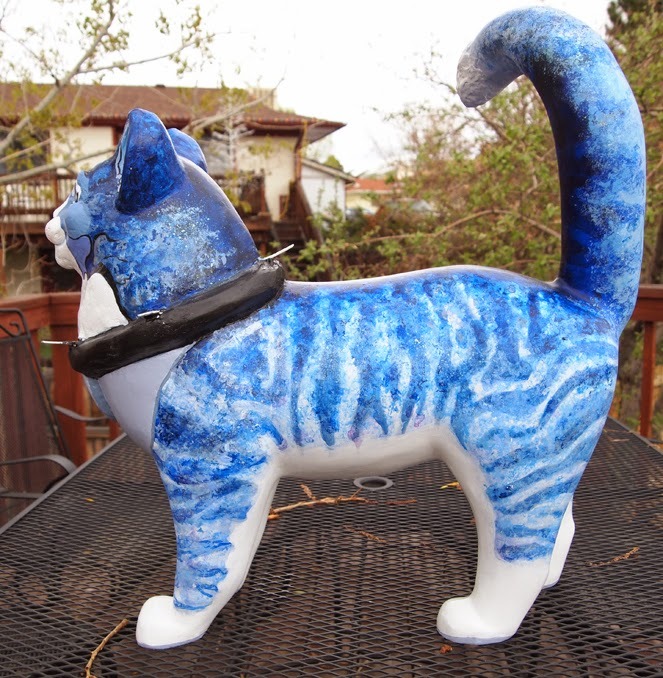 After that is accomplished, a fresh coat of gesso will be sprayed over the entire cat surface. Goofy Face - Note the rough areas in the crevices. These will be sanded out. Meanwhile, I'm working out the details of how to attach the space bubble over his head. Tricky stuff that requires lots of READING about materials compatibility, chemistry, and MATH. There will NOT be any fabric on the cat when it's complete. 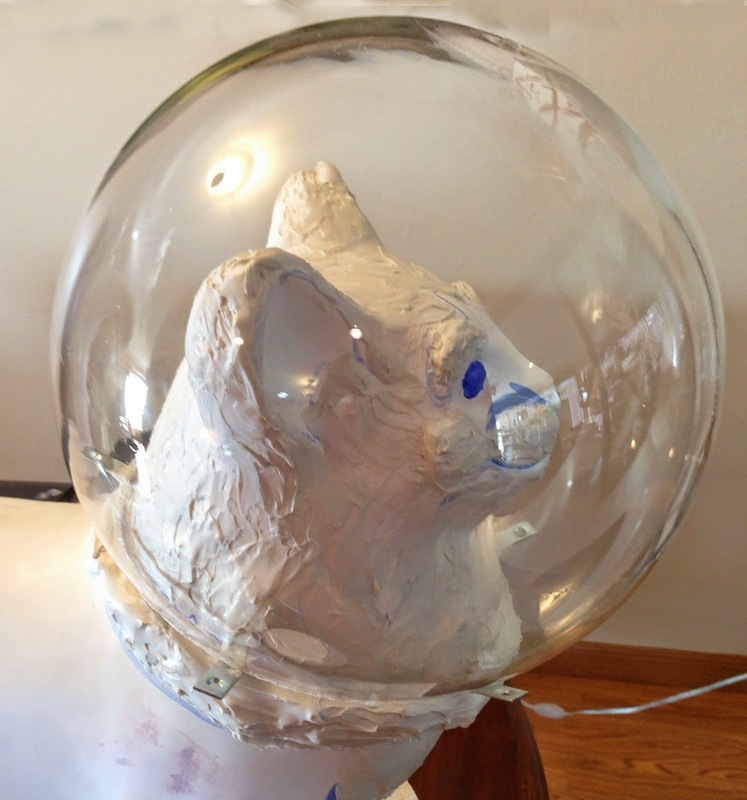 Rather, I am working with a moldable Thermoplastic for a secure way to attach the bubble to the cat form. Stay Tuned! Edit on 4/26/2015: This design detail was revised back to using a vinyl cover over the metal brackets. I created two separate circular pieces that nested together, with a Velcro® closure. Sewing vinyl with a circle cut certainly tested my sewing machine skills! Barb Benik works in oils, pencil, acrylics, and watercolor. She is a member of Plein Air Artists Colorado, Lakewood Arts Council (LAC) and the 40 West Arts District. If you would like to find out more about Barb Benik, please visit her website at www.barbbenik.com for more information.